Portfolium is both a student e-portfolio and a 21st century assessment/recognition application: the e-portfolio is a student/parent controlled private life-long collaborative repository of their learning journey; the assessment module is a set of customizable skill pathways based on performance requirements and milestones; recognition of mastery or growth or excellence is based on school-defined rubrics, competencies, skills or standards and rewarded with badges or (mastery) credits towards pre-requisites. Both the e-portfolio and the assessment/recognition solutions sync with any school’s student information and learning management systems. Leading independent schools’ enrollment management associations agree that the admission funnel is broken because applications appear last minute from potential families doing their research outside of traditional open house and other activities. Engaging inquiries and prospects earlier in the process is key. Equally, putting the student more in the process (but with continued parent oversight) is not something that application processes have gravitated to achieving: parents drive the process today in virtually all areas except standardized tests. An e-portfolio will give students the ability to showcase their interests and talents using technology they hardly need to be taught and a process of networking that is as natural to them as breathing. We have two solutions that give schools a choice of how to use this. If we are setting up an e-portfolio for your current students, we can add to your walled garden an exclusive area for your school applicants to build their portfolios. A lower cost network solution for you is for your applicants instead to pay for their own access. We are building such an Admissions Hub for all 2000 + independent schools (member and non-member OESIS schools) and their applicants. Available this summer for 2019-2020 admissions season, we believe it will become an alternative to the standard application solution. 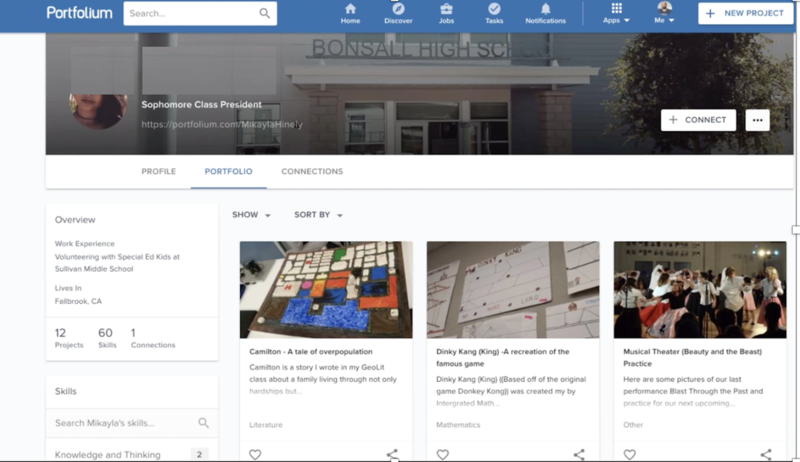 Hub participating schools will have their own pages, can search for applicants in their area, invite them to connect, see their accomplishments, projects and more when they do connect, and offer them ways to interact. By providing stealth inquiries and prospects an earlier way to connect from their websites, too, they are building important engagement earlier. Pathways or requirement submissions offered within the Hub could also be used to exempt applicants from parts of the regular application process as an incentive. With hundreds of thousands of K-12 students and 4+ million college students utilizing this platform, OESIS has partnered with Portfolium to bring a unique set of offerings to independent schools. ​For students (and for parents with kids under 13) it offers a totally private life-long repository of their learning journey, unlimited storage and great functionality to upload, showcase, collaborate and share their skills and competencies. This e-portfolio gives students agency over their work, offers a continuing record for conferences with teachers and parents, a custom transcript or resume of skills to share with colleges or schools. After they leave the school, it stays with them free for life. ​For schools, an Assessment & Badging Module faces one way and syncs with the student E-Portfolio, and faces the other way to sync with the school's learning management systems. This assessment module allows teachers to customize "Pathways" of requirements for students to submit for credit and badges, and milestones for completion: competencies and skills achieved, whether in a co-curricular program like Robotics or service learning, or an Academic course like Science lab Skills in High School or in a Sport, can then command recognition in the form of badges that are part of the system linking with student e-portfolios. This same system can be used for Teacher PD and Evaluation.